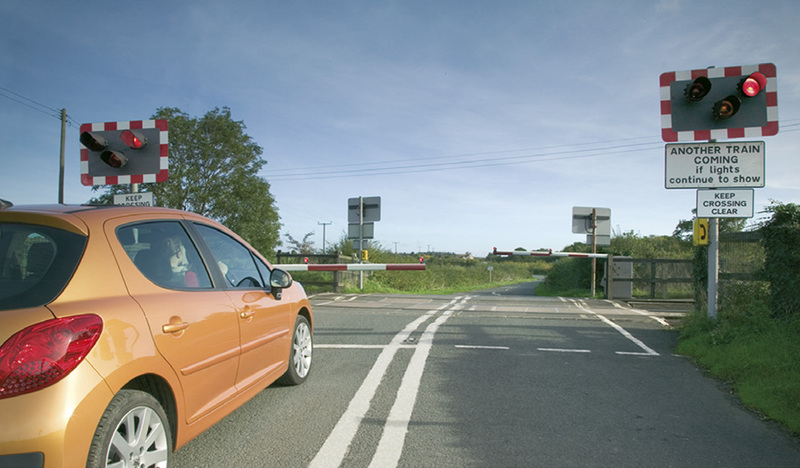 The Highway Code rules for road works, level crossings and tramways. Overhead electric lines. It is dangerous to touch overhead electric lines. YouMUST obey the safe height warning road signs and you should not continue forward onto the railway if your vehicle touches any height barrier or bells. The clearance available is usually 5 metres (16 feet 6 inches) but may be lower. Controlled Crossings. Most crossings have traffic light signals with a steady amber light, twin flashing red stop lights (see‘Light signals controlling traffic’and ‘Traffic signs’) and an audible alarm for pedestrians. They may have full, half or no barriers. If there are no lights, follow the procedure in Rule 296. Stop, look both ways and listen before you cross. If there is a railway telephone, always use it to contact the signal operator to make sure it is safe to cross. Inform the signal operator again when you are clear of the crossing.